You’ve probably already heard about Chamber Week already but we would very much like you to join us for a great week of activities. Every day offers you an opportunity to network, to explore opportunities the Chamber offers to help you grow your business and to have some fun! TUESDAY – Visit with various representatives from the SBA, SCORE, the Small Business Development Center, Bene-Care, Stellar Dental, BOCES and others to learn about the services and connections you can make that may be a resource to help your business grow or save you some dollars. Join us at one of the most unique venues in East Aurora, the Fisher-Price Heritage Center, 8am – 9:30pm. WEDNESDAY – Network and fun in the AM with the Chamber’s Networking Group, 7:50 – 9am at the Iron Kettle Restaurant – ($5) and later in the evening food, drinks and actual race car driving on the track at Holland Speedway – 5:30 – 7:30pm. No cost. THURSDAY – Business After Hours at Mambrino King, 5:30 – 7:30 pm – Complimentary drinks and wine tasting at another great East Aurora venue! FRIDAY – A special lunch time event with a hot dog roast at the American Grille in Elma – Noon – 1:30pm. No cost except for the cash bar. So plan on joining us next week for the fun! RSVP’s required as a courtesy to our hosts – 652-8444. Members, non-members and employees welcome! Is your business ready for Paid Family Leave? Join us for an intimate workshop to get connected directly to the Human Capital Management experts who can advise on the most pressing HR concerns. View workshop details! 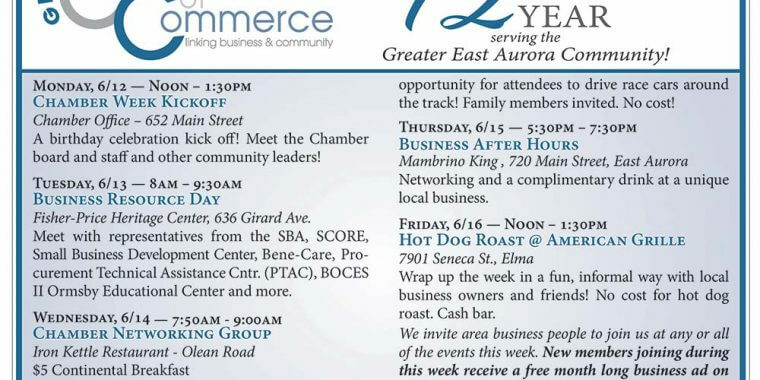 The Greater East Aurora Chamber of Commerce will be featuring the resources and strengths it brings to help local businesses achieve their goals during Chamber week Monday, June 12 through Friday, June 16. 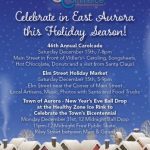 Each day that week the Chamber will highlight a specific activity or program which will offer the opportunity to present the different aspects of its work in helping to promote Greater East Aurora community businesses while working to create an environment for businesses to succeed. All GEA businesses, members, non-members and members of the community are invited to attend and meet Chamber board members, staff and other area business people. Join us for the Chamber’s 72nd Year Celebration with a birthday cake! Federal, State & local elected officials invited. Tuesday, 6/13 – 8am – 9:30am – Business Resource Day -Fisher-Price Heritage Center on the Fisher – Price Campus, 636 Girard Ave. – Meet with representatives from the SBA, SCORE, Small Business Development Center, Women’s Business Center at Canisius College, ECIDA, Bene-Care, P-Tach, BOCES II Ormsby Educational Center and more. Wednesday, 6/14 – 5:30pm – 7:30pm – Holland Speedway Business After Hours, Networking & Fun! Finger foods, beverages and an opportunity for attendees to drive race cars around the track! No cost! Thursday, 6/15 – 5:30pm – 7:30pm – Mambrino King Business After Hours, Networking and a complimentary drink at a unique local business. Friday, 6/16 – Noon – 1:30pm – Hot Dog Roast @ American Grille, 7901 Seneca St., Elma –– Wrap up the week in a fun, informal way with local business owners and friends! No cost for hot dog roast. Cash bar. We invite area business people to join us at any or all of the events this week. Please RSVP for each event by calling the Chamber office at 652-8444 or email eanycc@verizon.net. 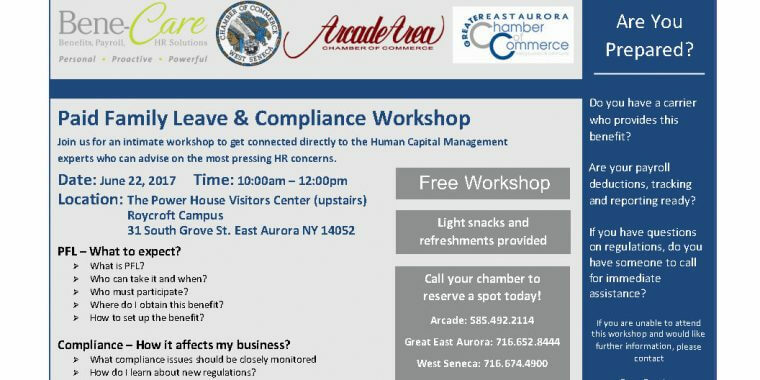 The website, which will officially launch Monday, June 5, provides numerous resources to both Chamber members and people who are planning a visit to the East Aurora area including member business listings, an event calendar for both Chamber events and community events, and a link to the Chamber’s annual Visitors Guide. The new site was designed and developed through a partnership with Bright & Brainy Creative Marketing and Surdej Web Solutions, both Chamber members. The site has a modern look that is clean, crisp and easily navigable. Members will be able to join or renew their membership online, something they were not able to do in the past. The website gives members the ability to “claim” their business listing and, after registering, edit or add their detailed business information such as logos, photographs, social media and website links, etc. Chamber members will also be able to advertise on the site. Information on advertisement sizes and rates can be obtained by calling the Greater East Aurora Chamber at (716) 652-8444. Bright & Brainy Creative Marketing is offering discounted advertisement design services to any member who is interested in advertising on the website. For more information please call (716) 392-6201 or email vsturman@brightandbrainycm.com. For more information on the website or advertising rates, please call the Greater East Aurora Chamber at (716) 652-8444.